PRE-OWNED 2012 Carolina Skiff Ultra Elite 19 w A Suzuki 150HP Outboard, 250 HRS! Ultra Elite Series is a boat of tremendous value, with a lengthy standard feature list, excellent fit and finish, and above all, outstanding versatility and comfort. This is one boat that will be going on fishing trips, day trips or cruises on the lake (or bay or river) for a long, long time. Our service department has performed a mechanical evaluation & water tested it and she runs out great - the motor has good/even compression on all cylinders. Surveys and mechanical inspections are welcome. Feel free to visit us at our Islamorada, FL location and see this boat in person! Click below for your FREE Boat History Report! That's right, we have already paid for it! 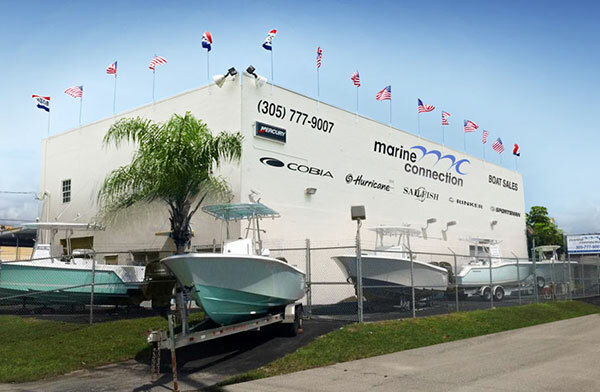 Marine Connection works closely with a number of leading marine lenders to offer you competitive rates, flexible financing options, a convenient application process, and prompt credit approvals. Our experienced and dedicated in-house financing team will work with you to help you accomplish your dream of boat ownership. This boat can be yours for only $215 a month and $2,209 down (with approved credit 7.99% annual percentage rate for 144 months)! We offer nationwide delivery to your door! Please contact our Sales Department for an accurate delivery quote. Australia: We ship to Sydney, Brisbane, Melbourne, Fremantle and all Australian ports. Please our Sales Department for the most accurate shipping rates. Canada: We can deliver to your nearest boarding crossing. Please contact our Sales Department for pricing. Europe: We ship to Bremerhaven, Amsterdam, Gotherburg, Southampton and all European ports. Please contact us for the most accurate shipping rates. We also offer CE Certification! South & Central America: We ship to all major ports, please contact our Sales Department for the most accurate shipping rates. Asia: We ship to all major ports, please contact our Sales Department for the most accurate shipping rates. While we attempt to display current and accurate data, this listing may not reflect the most recent transactions or may contain occasional data entry errors. Marine Connection makes no warranties, express or implied, regarding the content or availability of the products described herein. All inventory listed is subject to availability and prior sale. Please consult selling agent for details. Prices are quoted in US Dollars (USD) and may not include transportation, taxes, or other applicable charges. We offer a number of financing options with approved credit. If you are planning to use our financing services, please pre-qualify by calling us at 877.497.2552. Boat must be paid in full before delivery. All boats are charged a $399.00 administrative office paperwork fee, for Florida residents we also collect sales tax plus a $199.00 registration fee. For Miami residents, we collect a discretionary sales surtax of 1% on the first $5,000 of any boat purchase. Currency conversion is displayed for informational purposes only. Exchange rates can fluctuate hourly and rates for actual transactions may vary. Currency conversion is displayed for informational purposes only. Exchange rates can fluctuate hourly and rates for actual transactions may vary. The boat you are viewing has just arrived at our facility. Photos, condition details and a list of options will be available shortly. For more information immediately, please call our sales department.